Eco Products Maui supports Aquaculture and Aquaponics Industry with a line of economical and durable HDPE Products. The liners are custom made from high density polyethylene. HDPE is FDA and NSA approved for drinking water and is very resistant to UV damage. Unlike conventional vinyl, HDPE does not shrink or get brittle and crack over time. The molecules in high density polyethylene fabric are tightly knit which has the advantage of light weight relative to strength. Black HDPE liners are much more resistant to sun damage and remain more flexible over time then single layer low density fabrics like vinyl whose molecules create taste and smell in the water. Only with HDPE is there no “molecular transmigration”. Our patented reinforced HDPE tank liner fabric is exceptionally strong because it is made like plywood with layers in opposite directions. For the 6′ and taller water tanks we use a fabric that includes a mesh layer of nylon every 1/4″ in both directions which substantially increases the burst and tear strength. HDPE liners have exceptional durability and commonly have a service life of 15 to 20 years in Hawaii. The EPM product line is based on several HDPE and one mixed layered product especially designed product. We have products recommended lining troughs or solid tanks with a few layer of strong UV resistant HDPE at 12 + mil and we have our multilayed pure HDPE Liners that are strong on their own and work with simple wire frames. The thicker multilayered fabric is 22 mil and is layered up like plywood for much better tear strength then single layer fabrics of the same thickness. We can supply any dimensions of flat sheets or cylindrical liners in heights like 4’ for aquaculture tanks. We have supplied rolls of the thinner HDPE for troughs and tanks that are stable wood based for Aquaponics projects. HDPE is the best plastic available for fish as there is no taste or smell of vinyl plastic in the water. 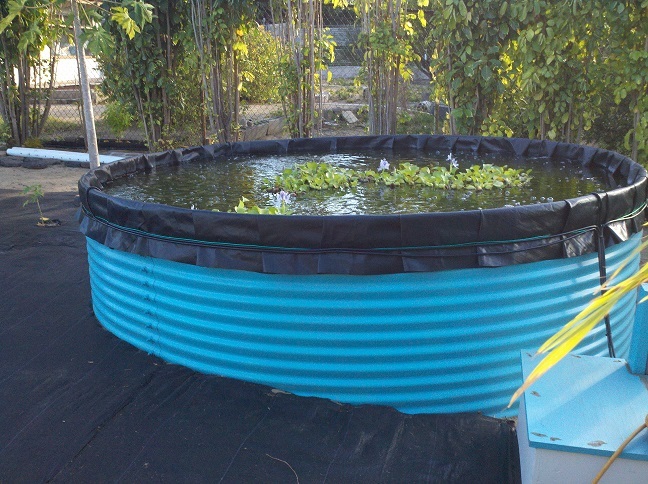 Only HDPE is totally approved for certified organic projects Aquaculture tanks are available. Contact us at your convenience with your Aquaculture or Aquaponics project ideas and needs. Eco Products Maui supplies grow beds in any size. We have 7′ x 30′ 22 mil black HDPE for $ 137 on Maui. All prices include all galvanized steel and galvanized hardware and Multi layer pure HDPE liner . All are one panel high so very easy to set up or move. as the only hardare is the vertical rows between each sheet. Metal takes about one + week for delivery these prices do not include freight or accessory items, HDPE Liners take about one month to deliver if we do not have the size you want in stock. The smaller aqualculture tanks are in stock most of the time but require mulit units to be shipped economically in most cases.